After all, let's say - creating problems to fix them. Despite the fanfare, the agreement doesn’t change much. Canada is the largest export market for 36 states and last year, it bought $340.7 billion worth of goods and services from the U.S. That’s twice as much as China! "Meanwhile, leading congressional Democrats say they’re not yet convinced that the new deal represents a significant shift from past trade policies that have rarely earned their support." Well, if the Democrats were so happy about NAFTA before, why would they be concerned whether or not the new deal would go far enough to earn their support? This is what I'm talking about, the deal needed to be renegotiated to reflect current day conditions. "The bar for supporting a new NAFTA will be high,” said Rep. Richard Neal (D-Mass. ), the ranking member on the House Ways and Means Committee." "Democrats and their backers in labor unions and environment groups will be looking for a deal they feel can be adequately enforced in terms of upholding worker rights and environmental protections." Again, without this newly negotiated deal, did they think that American jobs being ripped out of America was going to change itself? The deal needed to be renegotiated to finally give some protection to American workers, and maybe, if we're lucky and the deal is written well, some jobs may even come back to America. We will see over the coming days as the analysis comes through, not just what a biased MSM has to say about it. TORONTO (CBS/AP) - The United States and Canada announced late Sunday they'd reached a deal for Canada to stay in the North American trade pact with the United States and Mexico. The announcement was made an hour before a White House-imposed deadline of midnight on Sept 30. Senior administration officials speaking with CBS News called the pact a "big win" for the U.S. The administration officials told CBS News they expected it to be signed by Mr. Trump and his Canadian and Mexican counterparts on Nov. 30, then submitted to Congress, with a vote expected sometime next year. Getting Congressional approval could be difficult, especially if Democrats take control of the House, the officials said. They noted that the accord would come up for review every six years, which they said would give the U.S. significant leverage if Canada or Mexico don't comply with any parts of it. The importance of a new U.S.-Mexico-Canada trade deal can't be underestimated: Trade among the three partners affects jobs and profits in all of them, and all three wanted to get a deal done before the change of government in Mexico in two months, CBS News' Pamela Falk reports. The original North America deal took years to negotiate and commerce among the U.S., Mexico and Canada has relied on the continuation of a trade accord, Falk added. Canada, the United States' No. 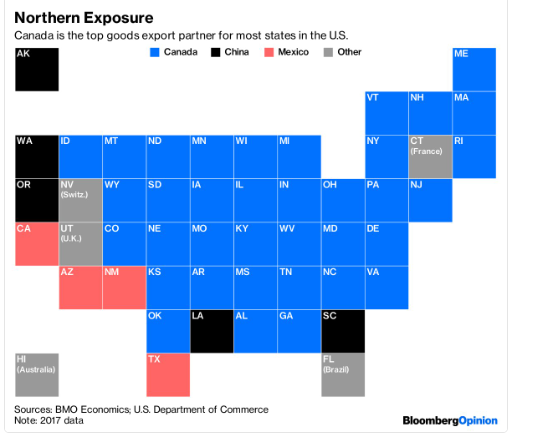 2 trading partner, was left out when the U.S. and Mexico reached an agreement last month to revamp NAFTA. So much American trade depends on the 1994 deal that U.S. financial markets were jittery about a possible collapse of negotiations -- and because Mr. Trump made campaign promises to get rid of NAFTA. Mexico's economics ministry said in a tweet earlier Sunday that the text of the pact would be delivered to the Mexican Senate Sunday night, adding that, "If there is agreement with Canada, the text will be trilateral. If there is not, it will be bilateral." Mr. Trump had said he wanted to go ahead with a revamped NAFTA -- with or without Canada. It was unclear, however, whether he had authority from Congress to pursue a revamped NAFTA with only Mexico, and some lawmakers said they wouldn't go along with a deal that left out Canada. U.S.-Canada talks bogged down earlier this month, and most trade analysts expected the Sept. 30 deadline to come and go without Canada being reinstated. They suspected Canada, which had said it wasn't bound by U.S. deadlines, was delaying the talks until after provincial elections Monday in Quebec, where support for Canadian dairy tariffs runs high. It remains to be seen by how much our trade deficits with Mexico and Canada will go down if not disappear to the level before NAFTA was passed. We'll see! I do not read much in the new NAFTA deal, it appears to be all smoke and mirrors, I hope I'm wrong. The American Petroleum Institute and other leading US business organizations initially welcomed the US-Mexico-Canada Agreement, which the Trump administration said would improve terms for them under the 1994 North American Free Trade Agreement it apparently would replace. Business groups also have begun to analyze USMCA to determine whether it preserves investment protections and other important NAFTA provisions, OGJ has learned. • Continued market access and no tariffs for US natural gas and oil products. • A requirement that Mexico retain at least its current level of openness to US energy investment. • Additional flexibility allowing US customs authorities to accept alternative documentation to certify that oil and gas entering the US have originated in Canada or Mexico. US Chamber of Commerce Pres. Thomas J. Donahue welcomed the renegotiated and modernized agreement. “We look forward to reviewing the details with our members to determine next steps, and we commend the negotiators for their commitment to finding a path forward that includes the US, Mexico, and Canada,” he said. Until the VAT loophole is closed, nothing much will happen. Ford and other car manufactured in Canada and Mexico will still enjoy an export subsidy (16-20 %) to the US that makes manufacturing in the US noncompetitive. A tariff on German automobiles of at least 40 % will be required to level the playing field, as German automakers benefit of a 19 % export subsidy (= 0 % VAT on exports) on top of their manipulating the € to a fault. The German Mark used to compensate for its huge trade surpluses, it no longer plays that role. A Benz is now cheaper than a Buick! Washington — Manufacturing and business groups welcomed the Sept. 30 announcement that Canada will join Mexico and the United States in a revised North American Free Trade Agreement, although they cautioned they wanted to assess the full details. Manufacturing groups, including plastics and chemicals trade associations, had been pushing for Canada to be included, after the U.S. and Mexico reached a tentative deal Aug. 27 but it had been unclear if Canada would join. Bill Carteaux, president and CEO of the Plastics Industry Association, welcomed Canada’s joining the final, modernized agreement and said the group wanted to review the new pact in more detail. The Washington-based American Chemistry Council said it too wanted to study the deal, which is being called the United States-Mexico-Canada Agreement, but called it a step in the right direction. ACC noted that the deal appears to include some enhancements long sought by the chemical industry, including adopting regulatory principles jointly pushed by the North American chemical sector. ACC said that duty-free exports to Mexico and Canada support 46,000 chemical sector jobs, and it said that U.S. chemical exports have more than tripled within NAFTA from 1994, rising from $13 billion then to $44 billion this year. The National Association of Manufacturers said it’s a positive move. Washington-based NAM said a united trade bloc in North America would help the three countries better address China’s “cheating and unfair trade practices,” although it cautioned it wanted to review details of the pact. “As we review the agreement text, we will be looking to ensure that this deal opens markets, raises standards, provides enforcement and modernizes trade rules so that manufacturers across the United States can grow our economy,” NAM said. Similarly, the Washington-based Business Roundtable said having all three countries would be “critical for North American supply chains,” and it noted that it would assess the full text of the agreement. The agreement must still be ratified by the governments of the three countries. A statement from the U.S. Trade Representative noted NAFTA remains in effect until that happens. The U.S. statement said the agreement will “create a more level playing field for American workers” with improved rules of origin on automobiles, trucks and other products, modernize agricultural trade and better protect intellectual property. It said the agreement contains new chapters on digital trade, anticorruption, regulatory practices and provisions for small and medium-sized companies. “When finalized and implemented, the agreement will create more balanced, reciprocal trade that supports high-paying jobs for Americans and grows the North American economy,” the USTR said. In a White House news conference, President Trump defended his trade negotiation strategy and said tariff threats are bringing other countries to the negotiating table. “Just for those babies that keep talking about tariffs, that includes Congress, oh please don’t charge tariffs, without tariffs we wouldn’t be standing here,” Trump said. “The USMCA will accelerate the manufacturing renaissance our country has enjoyed under President Trump,” he said. The language stirred complaints among some Canadians about a loss of sovereignty over one of the nation’s most valuable resources. Now, with production booming on both sides of the border, the clause has died a quiet death. The American Petroleum Institute, the lobbying group for U.S. oil and gas companies, said Monday that preserving it was “not a priority." Surging oil shipments between the two countries “have been a product of current market forces, and we don’t see any reason why that wouldn’t continue," Aaron Padilla, the group’s senior adviser for international policy, said by telephone. A new trade deal between U.S., Mexico and Canada, news that a group led by Royal Dutch Shell Plc are set to move ahead with a liquefied natural gas project on the country’s west coast, and a takeover offer for a Canadian energy company are giving the country’s stock market and currency the best outlook they’ve had in months. The flurry of developments on trade and energy lift an overhang that’s held back business investment and growth in the world’s 11th biggest economy. The Canadian dollar appreciated 0.7 percent to C$1.2815 at 10:17 a.m. in Toronto to the strongest level in more than four months while S&P/TSX Composite Index advanced 0.4 percent in following a surge in U.S. stocks. The new U.S.-Mexico-Canada Agreement, or USMCA, covering a region that trades more than $1 trillion annually, gives the U.S. improved access to Canada’s dairy market, stronger intellectual property provisions, and includes tighter rules of origin for auto production, according to two senior Trump administration officials who spoke to reporters on condition of anonymity. Auto company suppliers were among the biggest gainers on the Canadian stock index with Martinrea International Inc. up as much as 18 percent, Linamar Corp. advancing 13 percent and Magna International Inc. jumping 10 percent in early trading. The country’s benchmark stock index is down slightly this year despite strong global growth, making it the 11th worst performer among developed markets and trailing the 9 percent gain in the S&P 500. The loonie has risen in recent months but is down 2.4 percent in the past 12 months against its U.S. counterpart. Bank of Canada Governor Stephen Poloz had already been expected to boost the central bank’s key lending rate by a quarter point to 1.75 percent at the next meeting on Oct. 24. Beyond that, the trade deal also raises the possibility the economic could handle more than the two rate increases that had been expected next year, according to economists at some of the country’s largest banks. “The central bank, which had been concerned about exports and investment amidst rising trade barriers, can now more forcefully address mounting inflation pressures,” Krishen Rangasamy, senior economist at National Bank Financial in Montreal, said in a research note. On the oil front, Husky Energy Inc. made a C$3.3 billion hostile bid for MEG Energy Corp., setting up a battle between the Canadian oil company linked to Hong Kong billionaire Li Ka-shing’s family and Chinese giant Cnooc Ltd., a major investor in the targeted oil-sands producer. Following the announcement of Nafta 2.0, or the United States Mexico-Canada Agreement (USMCA), liberal news outlets CNN and Axios published articles suggesting that Trump's negotiation tactics might just be working. In a Tuesday article, CNN contributor David Andelman asks "What if Trump's confrontation trade stance actually works?" - which suggests that after USMCA was announced, "Trump largely got his way. And now, no one can tell him his bull-in-a China-shop way won't work." Axios's Jim VandeHei and Mike Allen offer similar analysis in their piece entitled, "The Trump way often works." For a left-of-center publication like Axios to publish an acknowledgement of Trump's successes is interesting, however for the insurgent "alt-left" at CNN, even admitting that Trump's tactics might be working is quite frankly shocking - even if it's an Op-Ed. Trump's unhinged-from-precedence-in-your-face negotiating style actually works.